Last week we reported the initial announcement and that preorders would be coming soon, but now Bandai Tamashii Nations have updated their webshop with pre-order info and high quality images of S.H. 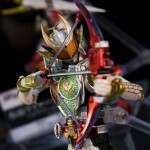 Figuarts Ultraman Zero Beyond. As previously reported Ultraman Zero Beyond will be released as a Tamashii web exclusive in November 2018 for the price of 5940 yen. However now we can also confirm that the figure will come with five alternate hands, a replacement colour timer, energy versions of his Beyond Twin Edge swords and an additional translucent purple fist effect part. Check out the full selection images after the jump! The special Ultraman page on the Bandai Tamashii Nations website has recently updated with a teaser confirming that the release of S.H. Figuarts Ultraman Zero Beyond. 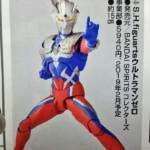 Previously unveiled at last year’s Tamashii Nation’s event, Ultraman Zero Beyond is the powered up form of Ultraman Zero that appears in Ultraman Geed. Other that displaying the figure facing off against the forthcoming S.H. 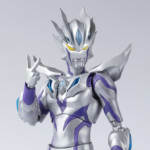 Figuarts Ultraman Belial Atrocious, the teaser image simply states that preorders for the figure will open on the 29th of June. However the newest wave of magazine scans also confirms that the figure will be a Tamashii web exclusive, releasing in November for the price of 5940 yen. So far the only confirmed accessory is his Beyond Twin Edge weapon, but expect more to be confirmed next week when the official images surface! 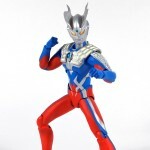 Are you ready to “beyond” and add the newest form of Ultraman Zero to your collection? Let us know after the jump! Check out the images of these upcoming releases by clicking “Discuss on the TokuNation Forums” at the bottom of this post. The Ultra-Act line continues its figure renewals with a brand new renewal version of Ultimate Zero, the powered up form that made its debut in Ultraman Zero: The Revenge of Belial! A powered up form granted to Zero by the mysterious Ultraman Noa! Releasing as a Tamashii web exclusive figure in September, renewal Ultimate Zero comes packaged with a selection of alternate hands, the Ultimate Bracelet, Ultimate Zero sword and the Shield of Baradhi. These weapons can also combine to form the Ultimate Aegis. Costing 4860 yen, preorders are open now! Time for another trip to the Land of Light! We’re back with another long overdue Ultra-Act gallery in the form of Ultraman Zero (V2)! Just to start, this figure is a VAST improvement on the original Ultra-Act Zero. Aside from implementing proper articulation and paint apps, this figure includes more accessories than you could have hoped for. Nearly every accessory important to the character is included, effect parts are a plenty, and the figure couldn’t look more perfect. This figure is an absolutely ideal example of the quality improvements this line has undergone since it’s inception. If you haven’t picked it up by now, then you definitely should. 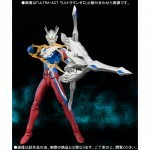 As it happens, TokuNation site sponsor has Ultra-Act Ultraman Zero V2 for $45.99. You’re doing yourself a favor picking this one up. 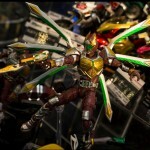 Click “Discuss on the TokuNation forums” to be taken to the full gallery of this figure! 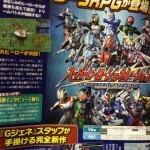 Click “Discuss on the TokuNation Forums” at the bottom of this post to check out all the images.